A bill just passed in Egypt that will empower the government to block users on social media for spreading “fake news” if they have over 5,000 followers. As of Wednesday, President Abdel-Fattah el-Sissi still needed to ratify the legislation into law, which he is expected to do given his government’s unmerited crackdowns on journalists and critics. Users with more than 5,000 followers on social media, including Facebook and Twitter, will be categorized as a media outlet, according to the legislation, and can be blocked or suspended by the country’s chief media regulator for publishing misinformation or encouraging law-breaking. The chief media regulator will be chosen by President el-Sissi and lead the Supreme Council for the Administration of the Media, which will oversee enforcement of the law once it’s ratified, Reuters reports. This official will also have the power to block websites and fine journalists. The new legislation, which requires websites to obtain a license from the government, also forbids journalists from filming in prohibited areas but doesn’t clarify or elaborate on what that entails. Critics of the bill characterize the language of the legislation as vague, and the Washington Post noted that it doesn’t expand on what it considers to be “fake news.” While supporters paint the bill as a victory for freedom of expression, its ill-defined phrasing and sweeping authority of censorship further el-Sissi’s reputation for unjustly silencing dissenters. “That power of interpretation has been a constant powerful legal and executive tool that was used to justify excessive aggressive and exceptional measures to go after journalists,” Middle East and North Africa program coordinator for the Committee to Protect Journalists Sherif Mansour, told Reuters. In the last year, Egyptian authorities have blocked hundreds of websites under the guise of eradicating terrorism or misinformation. 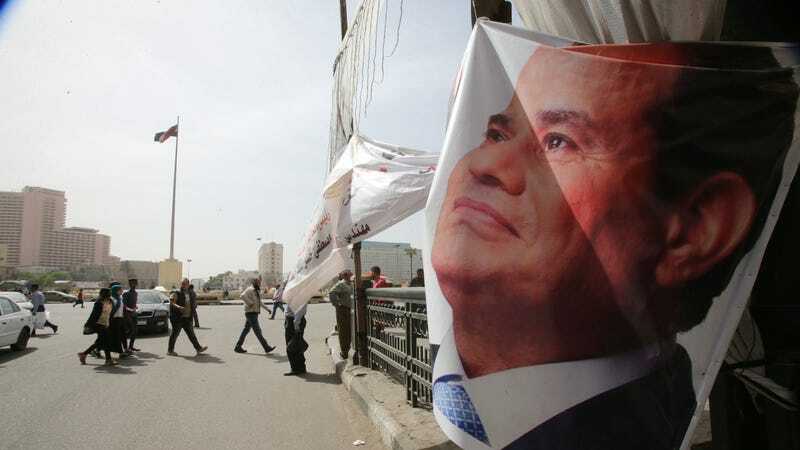 But Human Rights Watch this month called out the government’s arrests of critics, accusing el-Sissi of taking advantage of terrorist threats to silence non-violent dissenters. Human Rights Watch’s director of terrorism and counterterrorism, Nadim Houry, said he did so “cynically, as a cover to prosecute peaceful critics and to revive the infamous [Hosni] Mubarak-era state security courts,” the Associated Press reported. Egypt is not the first country to exploit fears of misinformation and security threats to create dangerously nebulous laws around fake news. Malaysia’s Anti-Fake News Act makes it illegal for individuals and online service providers to generate, publish, or circulate misinformation, an act punishable by up to six years in jail and a fine of up to 500,000 ringgit (about $123,000). The first person was charged under this law in April for posting a YouTube video accusing the Malaysian police of taking nearly an hour to respond to a distress call after a Palestinian lecturer was shot. Malaysia’s inspector general of police refuted this claim, and the person who posted the video was convicted of spreading fake news and was fined 10,000 ringgit (about $2,500). Not all proposed laws are as transparently exploitative as Egypt and Malaysia’s. French President Emmanuel Macron floated the idea of legislation that would include “an emergency legal action” that would give the government authority to block an entire website in an effort to curb fake news. It’s an extreme measure, and certainly a far cry from defending democracy and freedom of expression. But all of these proposed laws set a menacing precedent against peaceful criticism online, or, more insidiously, against nonbiased viewpoints that don’t support the ruling government. The shadowy language of Egypt’s bill together with the relatively low follower-count threshold puts an easy target on dissenters’ backs, threatening to stifle healthy discourse online.